It's the first comet to buzz the planet in 65 million years, and everyone seems to be celebrating its imminent arrival! Everyone, that is, except for Regina Belmont (Catherine Mary Stewart), and her younger sister Samantha (Kelli Maroney), two valley gals who care more about meteoric fashion trends than celestial phenomena. But upon daybreak, when the girls discover they're the only residents of Los Angeles whom the comet hasn't either disintegrated or turned into a zombie, they...well, they go shopping! But when their day of malling threatens to become a day of the mauling, these two val gals flee with both killer zombies and blood-seeking scientists in hot pursuit! After watching Kelli Maroney in "Chopping Mall" the other day I had the urge to watch this one with her as well. This is a movie that I just find plain fun... nothing more then that. Just "leave your brain at the door" fun. It has a nice mixture of comedy that works well in my opinion. It is just a shame that they did not add any type of extras for this one. I did however enjoy the scenes with the wheelchair in the attic. Some of the best one-liners are coming from you guys and your horror marathon reviews. I'm embarrassed to say I am a scaredy cat so do not watch very much horror and gore, but very much enjoy reading your experiences. 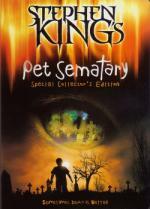 After watching "Pet Sematary" I felt like watching the only other horror movie I have with Denise Crosby in it. I enjoyed this one... but not the best I have seen out there. It definitely worth the time put into it. Though it is one of those horrors that leaves you wonder what the heck was that? Not that it is a big deal... as a lot of horror movies will leave a big question mark on that. "This is supposed to be based on a true story, usually when it happen I do some research after watching the movie to see what is true and what isn't. For this one I couldn't care less. For more than 50 minutes we have to endure 3 stupid and annoying "teenagers" while they do a car trip in Australia doing stupid things like every stupid kids. Finally after one hours a man who is as much annoyed than me with them decide to kill the idiotic kids. Sadly, for a guy who seams to have killed a lot of travellers he had a lot of problems for exterminate those 3. So we will have to wait another 35 minutes to finally see him succeed, but all this time we have to suffer the tribulations of the 2 girls. The stupid boy escape from our savior, but at least he doesn't have anything stupid to say anymore. Do I need to say that I didn't like this movie?" Grondhog Day - Supernatural Style. It's Tuesday every day in a town with a tourist trap called The Mystery Spot. Only Sam is aware of the phenomenon - and only Sam will be permanently changed by it. This is a really fun episode. I got a kick out of watching Sam stress out reliving the day over and over again. Definitely one of my favorite episodes. Is it right to sacrifice one person in the hope of saving many? Sam and Dean wrestle with that heart-wrenching question when they're jailed in a small town where the locals are possessed by demons. Another good episode. The way they were trapped in that jailhouse with demons all around was a bit reminiscent of Night of the Living Dead. 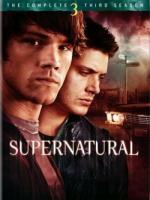 Title: Supernatural: Season 3 - Ghostfacers! Strap in for the scariest hour in the history of television! Ghost-hunting dweebs and reality show wannabes Ed and Harry invade the same haunted house Sam and Dean are investigating. The results are unreal. This episode... even though it is not bad... just didn't do it for me for some reason. I liked the story of the ghost... but I could have gone without the reality tv crap that was on there. I will never forget the first time I watched this movie... was shortly after I first got my job at the video store (18 years ago)... I remember thinking... all the movies I can watch... and for free!?! I couldn't wait to dig in... and of course the first place I hit was the horror section. And I found this gem buried deep in the huge horror section. (our store had over 10,000 titles total) I must say this movie is one of my favorite (And one of the most underrated) vampire movies out there! Over the years I have watched this movie countless times. And I was completely thrilled when I first heard it was coming out in a 2-Disc edition DVD. This was one movie I preordered as soon as I was able. After receiving a mysterious mask, Ellen Morris believes she was attacked by an evil being she calls "Nightmare Man." Her husband, Bill, believes she is crazy. On their way to the mental hospital their car breaks down and Bill goes to get gas, leaving Ellen alone. When Nightmare Man appears, Ellen takes off into the woods, unsure whether she is hallucinating or not. She stumbles upon a cabin filled with friends who unknowingly becoming prey the moment Ellen steps inside. 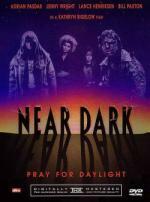 This is another of the After Dark Horrorfest collection. I had low expectations going into this one... as it is one that a friend of mine told me she didn't care for all that much. Over-all I have to say I enjoyed it... more then I thought I would. It had some decent stuff in it... some things I didn't see coming. Other stuff I had figured out early. Then it also had some problems. For one the writers could have done a better job. The storyline itself was pretty good... but some of the dialog made you wonder what they were thinking. It was like they were trying to get every cliche' saying into the script that they could think of. Over-all I am glad I added it to my collection. I was checking out some online reviews for this movie... and discovered that it is not a very liked movie. I was kind of surprised by this... even though it is not one of the best vampire movies I ever seen... I definitely enjoyed it. I first saw this movie on cable... I think on the USA channel... or maybe it was on the Sci-Fi channel... don't remember for sure. But I remember thinking then how much I enjoyed it... and was happy when it was announced for release. Since buying it I watched it around 4 or 5 times since. So I definitely feel it is worth the time to put into the movie. But after seeing a bunch of the online reviews I would say maybe you should rent it fist... after all... I know I tend to be more forgiving then most people when it comes to horror movies. It also helps that I am a big fan of genre actor Lance Henriksen... who plays the Police Captain. Calls from dead loved ones lure the living to suicide. For the brothers, it's a classic exercise in demon hunting logic. But Dean loses his scientific detachment when he receives one of the calls...from John. This is a good... but somewhat basic episode. No real advancement in the season long arc. But I did enjoy it. In 1816, a doctor sought the secret of eternal life by harvesting vital organs from the living. Maybe he found it: the doc is still going strong in 2008. This is an episode I liked a lot. Not only for the storyline... which is really good... but because it was fun to see Billy Drago in this episode. I have become a fan of his every since I saw him as Barbas in several episodes of Charmed. Every since then I been trying to get a nice collection of his work. Dean's time has run out... With Bobby at their side, the brothers battle Lilith and her demonic army in a last, desperate attempt to save Dean from eternal damnation. This is the final episode of the third season... so of course they are going to do their best to make it a good one.... and it definitely was! I enjoyed every second of this episode. Just as much as I did the first time I saw it... when it originally aired. Now that I have this boxset complete... I can start on the season 4 episodes I been recording. This frightfully fascinating five-DVD set chronicles the history of movie horror from earliest experimental chillers through the unforgettable "golden age of movie monsters" and on through today's graphic horror films in 26 horrific, half-hour shows. Hosted by 'Christopher Lee', the screen's legendary King of Horror. There is more to Dracula then just Bela Lugosi, as the cinema's various incarnations of the carnal count are examined. This is the first thing I am finally getting around to watch in my new "other" category I added to this year's marathon. This is a multi-part documentary that spans 5 discs. Each disc containing about 5 parts. My first taste of this documentary is very good... I think I will be enjoying this set. It was fun seeing all the different incarnations of Dracula in the movies... and gave me a few ideas of some more classic Dracula movies I will want to check out. NOTE: The plot contains Spoilers if you have not yet seen season 3. Dean awakens in a pine box, freed from hell, and has a joyful reunion with Sam and Bobby; Sam, Dean and Bobby wonder what pulled Dean from hell, and what it will want in return. This is a great start to the new season. I enjoyed every second of this episode. I also enjoyed the reveal at the end... even though it was somewhat obvious. Dracula isn't the only blood-sucker immortalized on film. Here is some of his "competition." This one goes on to the vampire movies that are not about Dracula. Very interesting... getting lots of ideas of movies I never seen before. And even some I have watched but didn't realize they were based on the vampire legend. The spirits of Meg and Agent Henricksen appear and accuse Sam and Dean of failing them. Another really good episode. In this one we learn what the season long arc will be. And it looks like it will be a big one this time around. If it keeps up at this rate... this could be the best season yet! Dean is shocked when he is transported back in time to Lawrence, Kan. Yet another really good episode. This one ends with the dreaded "To Be Continued"... but thankfully I have the next (well next 2) episodes recorded waiting for me to watch. So I don't have to wait a whole week to see it continued. Sam and Dean discover a man who is changing into a flesh-eating monster. This is the second part to the episode above. It is a good episode... but pretty basic. Just a Monster of the Week type thing. Dean and Sam investigate when several murders take place at Oktoberfest; Dean thinks a shape-shifter demon is terrorizing the town as iconic monsters from old movies. This is nothing more then just a fun episode. It has nothing to do with the season long arc... another monster of the week type episode. The entire episode was in black and white... and had three of the major monsters from the classic movies... Dracula, The Wolf Man and The Mummy. I really enjoyed this one... but I think they should have saved this one to air the night before Halloween. Put him together and he'll tear you apart! Well this is one that is not very good at all. I have seen worse... but not by much! I have watched this one before... four years ago when I first got it. But I forgot just how bad this movie is. Don't waste your time.